Chef Sarah joins the line-up for the 2018 edition of Paw’s Up Montana Master Chefs event. The weekend brings together dinners, wine tastings, chef cook-offs, wilderness adventures and mingling under the Montana skies. Chef Sarah and the team are hosting their first brunchy-lunchy event at Monteverde with acclaimed culinary MC, Billy Harris. Enjoy a multi-course wine paired lunch featuring White Truffles in select dishes and a welcome cocktail reception with morning cocktails and passed bites. Priced at $155 (includes tax & tip) with proceeds from the live auction benefiting The Trotter Project, presented by Barilla. The James Beard Foundation returns to Chicago in 2018 for their Taste America series with a weekend of culinary programing. 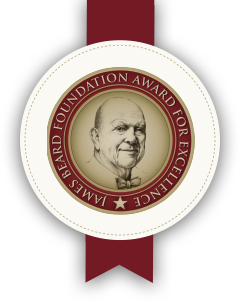 Chef Sarah will join forces with fellow James Beard Award-Winner Karen Akunowicz and Chef Fabio Viviani to present a three-course dinner. Chicago chefs will offer up tasting bites at the welcome cocktail reception. Tickets are now sold out, but guests can sign up for a waitlist. Chef Sarah will participate once again in the Feed Your Mind gala to benefit Pilot Light Chefs, which assists children in making healthier choices by connecting lessons they learn in classrooms to the foods they eat on their lunch trays, at home and in their communities. Chef Sarah heads to New Orleans for the Emeril Lagasse Foundation’s Boudin, Bourbon & Beer event. Over 70 of the nation’s best chefs will put their spin on boudin – a Cajun favorite. Ticket proceeds benefit Emeril’s foundation, whose mission is to inspire, mentor & enable youth to reach their fullest potential through culinary, nutrition and arts education. Chef Sarah joins in some pre-winter break fun at the Palm Beach Food & Wine Festival with nationally acclaimed chefs for dinners, demos and more! She’ll be cooking an Italian feast with Chefs Tony Mantuano, Michael Pirolo and Fabrizio Giorgi on Thursday, December 13th and then serving up bites at INDULGE on Saturday, December 15th. Welcome 2019 at Monteverde! The evening will include prix fixe menus filled with Chef Sarah’s favorite dishes to ring in the New Year. From 9:00 – 10:30 p.m., $125 per person for a five-course prix fixe menu, $40 wine pairings. Includes table for the rest of the evening, live music from Rick King’s Royal Hustle - Featuring Marty Sammon, and a bubbly toast at midnight. To reserve a table or for any questions, please call 312.888.3041. Please note all reservations must be made by calling our restaurant. Chef Sarah returns to this acclaimed event that raises money for the Naples Children & Education Foundation to support programs that improve the physical, emotional and educational lives of underprivileged and at-risk children in Collier County, Florida. Chef Sarah joins an all-star line-up of chefs. Chef Sarah returns to the South Beach Wine & Food Festival this February to participate in two events. Join her on Thursday, February 21st for Italian Bites on the Beach and/or Friday, February 22nd at the Perez Art Museum Miami. Chef Sarah welcomes back friend, journalist and cookbook author Katie Parla to celebrate the release of her second book Food of the Italian South: Recipes for Classic, Disappearing, and Lost Dishes. Chef Sarah and team will cook recipes from Katie’s book alongside some Monteverde interpretations, highlighting the regions of Basilicata, Calabria, Campania, Molise, and Puglia.